When you need to buy a gift for someone who seems to have everything, personalized jewelry boxes from Chasing Treasure is always a useful and popular gift. When people have everything, they need places to store their things. Our heirloom quality jewelry boxes, armoires, travel cases, and watch boxes can easily be personalized to make the gifts truly one of a kind. If you choose a wooden jewelry box, you can have a name plate added. If you choose to give a leather case, you can pick from embossing or engraving for personalization. Whatever you choose, your gift will be something that the recipient will cherish for years to come. Personalized jewelry boxes are perfect gifts to give, especially when you do not know what to give. Jewelry boxes with engraving are much more memorable gifts that gift cards or cash. They are nice to give to high school or college graduates. They are also nice to give as engagement, wedding, or even new baby gifts. Moms and dads appreciate them on Mother's Day and Father's Day. They also make nice gifts on major birthdays, especially a Sweet 16 or a 21st birthday or even for an older birthday like a 60th, where you know the recipient has plenty of beautiful jewelry that needs proper storage. When you shop for a wooden jewelry box on ChasingTreasure.com, you will notice that we have some boxes that are designed for personalization. Some of our jewelry boxes already come with attached name plates that are ready for us to engrave for you. If you want to have a name plate attached, we do have those offered for sale, too. You can choose a brass or nickel plate as well as your choice of four different fonts. You will need to choose whether to pick from two attractive monogram options or from a script or block print font. We do not put the engraved plates on the jewelry box, unless they are already on the boxes; so, you will be able to put the plate exactly where you would like it. If you would like to personalize a wooden jewelry box, you will need to pick a box that has a flat surface either on the top of the box or on the front. Since you can purchase a brass or nickel plate separately, you can easily personalize any jewelry box that has space for the plate. It is a good idea to pick the metal that will coordinate appropriately with the jewelry box and its hardware. Many of our personalized jewelry boxes are made by our top manufacturers like Reed & Barton, RaGar, and Jewelkeepers. You can pick from boxes made of mahogany, ebony, zebra wood, teak, cherry, bubinga, as well as boxes with burl wood inlay. Some of our youth jewelry boxes in a white painted finish also come with personalization. We also have a few with ballerina music jewelry boxes with personalization available, too. Our menÃƒÆ’Ã†â€™Ãƒâ€šÃ‚Â¢ÃƒÆ’Ã‚Â¢ÃƒÂ¢Ã¢â€šÂ¬Ã…Â¡Ãƒâ€šÃ‚Â¬ÃƒÆ’Ã‚Â¢ÃƒÂ¢Ã¢â€šÂ¬Ã…Â¾Ãƒâ€šÃ‚Â¢s jewelry boxes are sized to fit cuff links, tie tacks, and rings as well as watches and other pieces. We pride ourselves on having a variety of attractive, functional, and well-crafted jewelry boxes that make perfect gifts, especially when you personalize them with our brass or nickel plates. When you purchase one of our high end jewelry boxes that come with a name plate already attached, your engraving is free. If you prefer a leather jewelry box or travel case, we also can personalize those. We usually have a few options for the leather cases and many of them have smooth finishes that lend themselves nicely to personalized name plates. If you purchase the leather jewelry boxes in brown, the brass plates tend to look the best and the nickel plates complement the black boxes. However, many people like to coordinate the metal plates with the colors of the hardware on the box to create a monochromatic look that is timeless. Some of our leather jewelry boxes and travel kits have the opportunity for leather embossing. This type of personalization looks exquisite on the top of a smoothly finished leather jewelry kit and many men find this style to be attractive and masculine. Watch boxes, cuff link boxes, and other masculine jewelry cases lend themselves to this timeless personalization technique. All of our leather jewelry boxes that are appropriate for personalization are designed by RaGar. This company has been designing cufflink, watch, and collector cases for over 15 years and they are well known and respected for their high quality craftsmanship. The attention to detail and use of impeccable textiles makes them one of the best manufacturers of leather and wooden jewelry boxes all over the world. You will not be disappointed by any piece that you buy from Chasing Treasure that was designed by RaGar. When you decide to personalize one of the beautifully crafted jewelry boxes or armoires from Chasing Treasure, you have so many options. One of the most popular and traditional options for personalizing is with a monogram. We engrave a monogram with three letters in a classic script or block print font. When you choose a three letter monogram, it is important to know that your last names initial goes in the middle of the monogram. This last initial that is placed in the middle of the monogram is always larger than the two other letters. The first initial goes to the left, in the first position, and the middle initial is to the right, in the final position. This may seem unusual to people who have never ordered a monogram, but they have been done this way for many, many years. The idea of placing the initial for the surname in the middle shows the importance of the surname, which is also why the initial is the largest in the monogram. Our other engraving options include up 23 characters. Some people choose to just put the initial of the last name on the box, because it makes it easier to pass the box down to later generations with the same last name. With a complete monogram, the box really seems to belong only to the person with that monogram. If you choose the option of using a longer phrase, there are many possibilities. 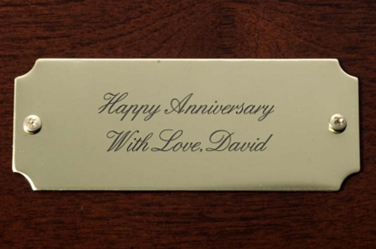 You could have well wishes like Happy Birthday or Happy Anniversary printed on the metal name plate. You could have a full name or a full last name printed, too. You could even have a favorite team name or number imprinted or even a short nickname put on the engraved plate. If you are giving the gift as a retirement gift, the date of retirement could be printed on the box. The opportunities are only limited by the space and by your imagination. 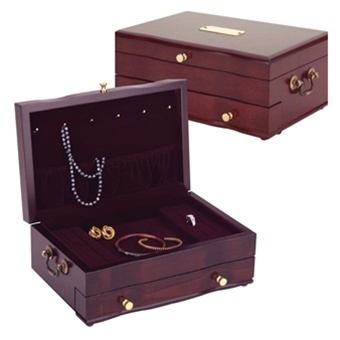 On our website at Chasing Treasure, we do suggest certain jewelry boxes for personalization. However, every jewelry box that we sell could be personalized. Traditionally, personalized name plates are put on the top or of the front of the jewelry box, but as people change their traditions, personalized plates could be put in other locations. Some people will put personalized name plates on the bottom of the box, because they include special messages. They also do this because they do not want the personalization to overtake the beauty of the craftsmanship. By putting the personalized name plate on the bottom, you create a truly private message that the owner has a his or her own little secret. If you are willing to put the personalized plate somewhere non-traditional, then jewelry armoires can be easily personalized. Since these have several drawers and cupboard spaces, each spot that opens could potentially be a spot for some personalization. It can be a nice surprise for a gift recipient to open a draw or door and find not only a special piece of jewelry but a special reminder about the person who gave that gift. Armoires usually also have space at the bottom for a personalized name plate, even though this will only be seen when the armoire is moved. If you do not want to put the personalized plate on the top or front of the jewelry box, there are a few places that you should avoid. The top of the inside of a jewelry box might seem like a good place, but if you put a brass or nickel plate on the inside of a jewelry box, there is the chance that the plate could scratch the jewelry. The reason that many jewelry boxes have fabric on the inside walls is to keep jewelry free of unwanted scratches. Since our customizable name plate does come separate from the jewelry box, leather travel case, or armoire that you order from us, you could leave the location for attachment up to the gift recipient. We sell more than just wooden jewelry boxes and leather jewelry cases. We also sell a full line of trinket boxes that are covered with Swarovski crystals. These small boxes also make great gifts, but they are too small for our personalized metal plate. Fortunately, if you order the crystal trinket boxes with enough time, you can usually find a local jeweler that can engrave a special message or a beautiful monogram on the bottom of the trinket box. These special little boxes that come in a variety of different and clever shapes make unique gifts and with a little personalization on the bottom, you have created a one of a kind gift that your recipient will love. Some of the boxes are appropriate for new moms, recent graduates, dog lovers, and musicians, so if you are able to get them personalized, the messages can reinforce the event that was cause for purchasing the gift. You can even fill the trinket box with a special trinket that will make the event even more spectacular. Many of our amazing jewelry boxes with name plates that are perfect for personalization are made by the designer Reed & Barton. This name is well known in the world of sterling silver and silverplated gifts, so it is only appropriate that many of their jewelry boxes come with name plates ready for engraving. This company has been in business since 1824 and they still use many of the artisan methods for working with fine wood, silver, and other textiles. Their gifts have been turned into keepsakes that have literally been treasured for generations. It is not uncommon to see Reed & Barton silver or silverplate in families that have been in the United States for many generations. As the largest jewelry box and flatware manufacturer in the world, newer companies look to the traditions that Reed & Barton set nearly 200 years ago. Their jewelry chests are made of the best hardwood and the finest silverwork. When you give a Reed & Barton jewelry box or chest, you are giving your gift recipient a piece of history that is meant to be passed down from generation to generation and it is meant to last for several generations. Adding a personalized touch to a Reed & Barton jewelry box is just another way to show that you love and care for the person who is receiving the gift. When you decide to give a jewelry box or travel kit from Chasing Treasure, the best way to choose the gift is to decide what you would like most of all. You should know a little something about the jewelry that the recipient has, so you buy a box or chest that is big enough, but you should choose what you like because the person you give it to, will like it too.